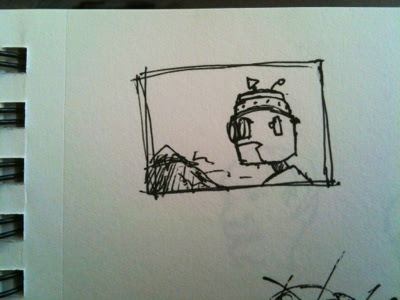 Here's a bit of the robot and the sky behind it. Update: here's a second photo with the sky all finished. I'd really love to show off more of this robot painting, but of I'd really rather not give the whole thing away before it's finished, so here's part of it, at the underpainting stage. 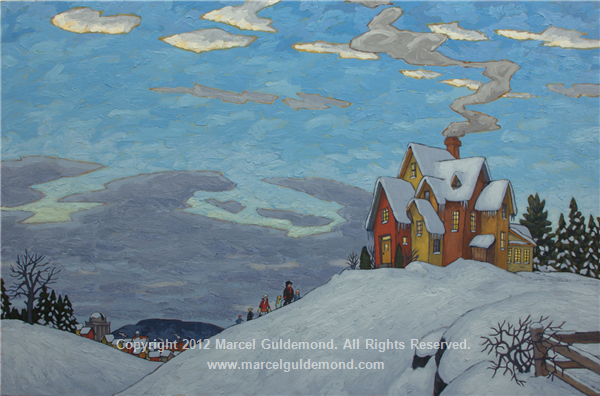 Here's the finished painting, now that I've finished processing the proper photos. I'm still toying around with the title, but for now it's called "red house, yellow door, snow covered, winter's eve, world's gone blue, and boogers freeze." 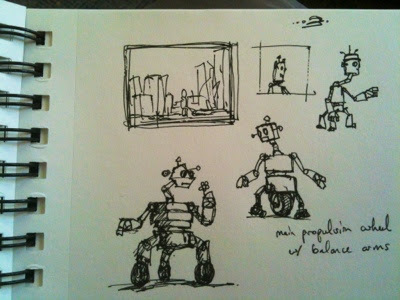 I've spent a bit of time trying to figure out what to do for my next set of paintings, and I've done some doodling as a part of that process, and that included some robots. 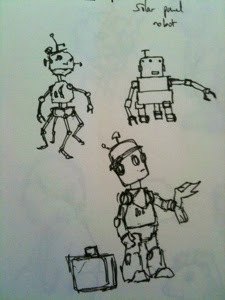 While I continue to plot my world takeover, er, I mean, figure out what to do next, here are some of the sketches. Enjoy! 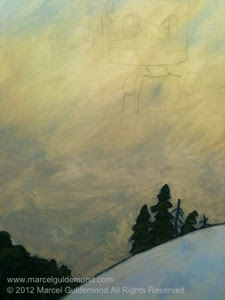 I just adjusted the lighting in the sky on the winter house painting. I thought I was finished last week, but today when I looked at it I knew it needed a bit of adjustment. I sometimes try to avoid that because there's not an infinite amount of time to do paintings and I have to get to the next one, and you'll never be 100% happy, but in this case, better to adjust out quickly and get it over with. More from the blobby paint phase. More of the blobby paint phase. 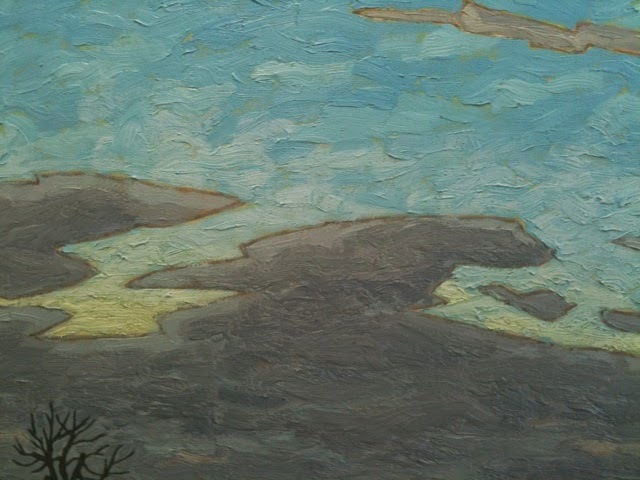 The sky and clouds are done, and the town gets some colour. Getting closer and closer to finishing this one. This one's going very well, but when I add so many elements to it (house, people, town, landscape, stupid bramble-y bushes) it takes a long time. Maybe for my next ones I'll try to do dead simple landscapes or something. There's a saying in software development - KISS - Keep it Simple Stupid. I think it holds for art too. Of course, what do I go and do? Add a bramble-y bush into the foreground of this painting. The painting's going well, but boy am I stupid! 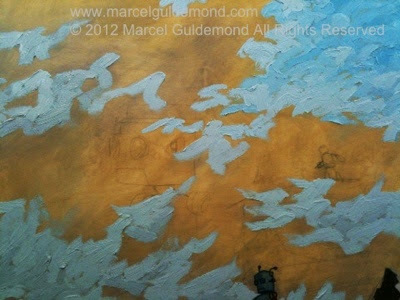 Work in progress photos from the underpainting stage. Here's a sneak peek of the painting I'm working on. I feel really good about this one right now. Hopefully I still feel that way once it's done. There's still a lot of painting to be done between then and now and you never know how it's going to go. Anyway, more sneak peeks tomorrow.